Four painters display their work at Old Crow Tattoo & Gallery. 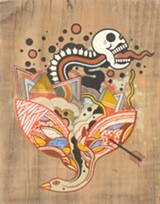 David Polka's art is influenced by graffiti and anime, among other things. To the unhip, tattoo shops may seem like surprising places to find fine art. In fact, they have become renowned bastions of the übercreative — uninhibited environments where, among the ever-present hum of tattoo needles, some of the most talented artists choose to display their immaculate, surreal, hypergraphic work. An excellent example of this new kind of hybrid exhibition is a show of four local artists, Sweeping of Giants, at Old Crow Tattoo & Gallery (362 Grand Ave., Oakland). Each exhibiting artist — painters Shawn Whisenant, Jeff "Weirdo" Jacobson, Jessica Jenkins, and David Polka — is so different and yet so skilled that I had to ask each the same simple question: Where does your imagery come from? For Whisenant, it comes from everyday life: "Lurking in the streets of San Francisco writing graffiti, skateboarding, traditional sign-painting, and walking my dog are just a few of my inspirations," said Whisenant. "Most of my work, especially my sewn pieces, is determined by what I come across in the street. Found parking tickets of different colors and textures, cut up and reassembled with multicolored thread, all come together in an improvised manner to form each unique piece." Jacobson draws his inspiration from life and death: "I paint my family and friends, people close to me," he said. "I do this because it is documentation of the world I live in. By taking my subjects out of everyday context and putting them into my weird world, I create a dreamlike mood. Then comes the addition of 'Organs,' these ambiguous fungal-like forms representing the spiritual side of life, like looking through a special pair of glasses. I paint triangles representing all the abstract information we in the modern world are surrounded by." Last summer, Jenkins discovered an amazing book that held thousands of images: "The pages held digital reproductions of old etchings and lithographs that illustrated anatomical diagrams, old medical procedures, surgeries, diseases and oddities. Modern medicine was kind of like magic to me until I started wrestling with an array of undiagnosed stomach problems, and now I see it as some kind of bizarre guessing game. I think my pieces are birthed out of this fascination, and the simultaneous distrust I have for it." Polka's imagery is far more abstract: It includes "flowing, abstract forms enveloping figures weary from loss and hardship in an exploration of transitory connections, with irrevocable patterns of life and death, destruction and rebirth," he said. 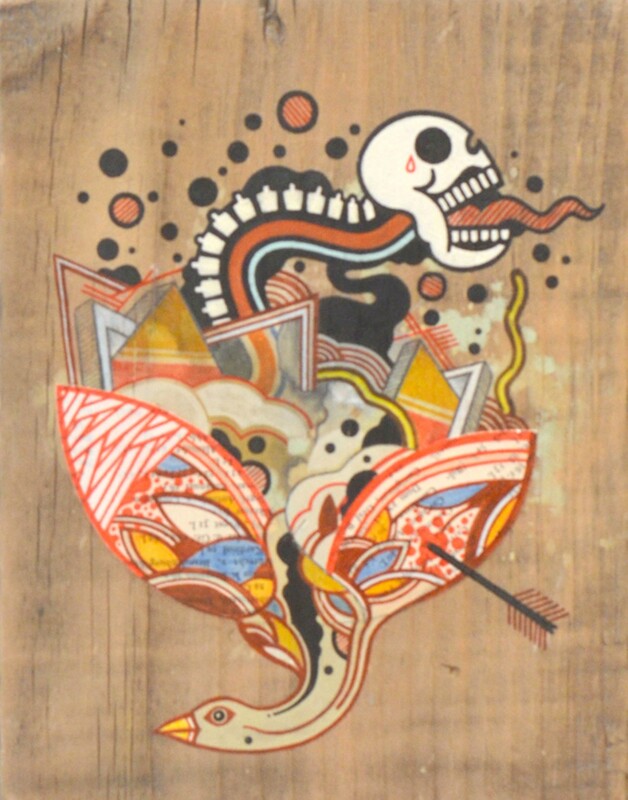 "My work reflects a myriad of aesthetic influences including Native American art, graffiti, anime, colonial and Byzantine art."